She’s one big dirty diaper! And diapers need to be disposed of! But yet Pelosi and Nadler have no problem with Snoop Dogg insinuating shooting President Trump. They have no problem with a certain female dog who threatened to blow up the White House. That and other incitements don’t bother these Democrats because they were made against an evil white heterosexual bigoted racist Republican. It’s only against a divorced female Muslim that they’re concerned. Hypocrites. What’s with this insane obsession in the Democratic party to allow this woman to continue unchecked? When does it end? At what point will they accept that she is Anti-American, that it is she who holds dual allegiances?? Is having a Muslim in Congress more important than your very own country? How is reposting her own words threatening. I’d call it “highlighting”. She’s clearly anti everything america, except for insisting on everyone else tolerating whatever she says, ironically. The Capitol Police are under the joint direction of the leaders of both houses (and totally separate from the executive branch), so Pelosi can order extra security for any member of her caucus. Given the outrageous sorts of thinks here caucus tolerates when discussing Trump (e.g. cheering someone who called for beheading the president and displaying a mock Trump head), she is hardly in a position to complain about much milder speech from the Republicans. Ilhan Omar should be deported back to Somalia where she will be more safe. This pattern is the PC of today. Someone who abuses others jumps up to claim victimhood. Omar y”sh is a terror supporter, and her remarks reflect the evil in her heart. Her position in Congress gives her a tad of power,, and that is scary for everyone with a moral value to them. When her evil is highlighted, it suddenly transforms into a threat, requiring security, and counter accusations. How sick. May every one the politicians who endorse this approach be voted out of public office. Yes, Nadler, Pelosi, Waters, AOC, Talib, and the rest. As far as I am concerned, they manifest something we hoped to have eliminated when Obama left office. It was erroneous to say there wasn’t a terrorist Obama would not support. It was more accurate to say there was no terrorist he wouldn’t look to fund. That’s these rogue politicians. May they be forced out of politics ASAP. How about ordering for us some security protection from her! IMAGINE Three New Congress women with NO Experience, including a former Bartender, and intheir first few months in the halls of US Government they are shooting off their mounths insulting veteran members and the president left and right as if they are the new rulers of the US?!?!?? Is this what would happen SOuth AMerican Migrants would be allowed to Overwhelm our country and SYstem as well as Islamic Jihadists???!!!!! Maybe thisis what the Democratic Party had in mind for our country?!?!? Pathetic world! Trump should put a little more thought in his comments,posts and tweets but by golly can she PLEASE apologize for her callous, shallow and unsympathetic choice of words towards the nearly 3000 victims! 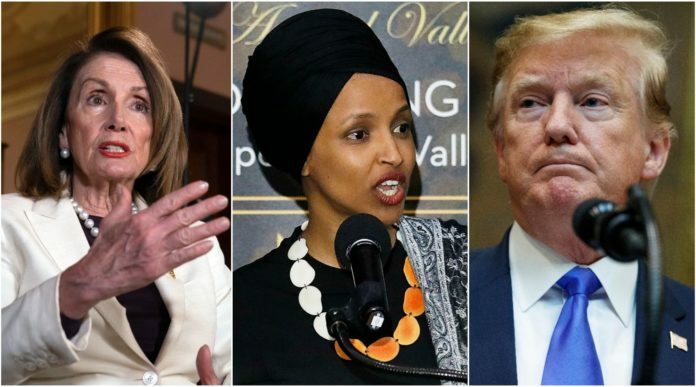 OK Rep. Ilhan Omar , now it is your turn to show that it is not just Jews you hate but all infidels, like Christians as well. How about a comment on the fire in Paris yesterday. What about “things happen, like the Twin Towers collapsed, so did the spire at the French place”. That will show the world both how genuine you are in your hated of all non muslims and how you are not afraid of POTUS Trump.